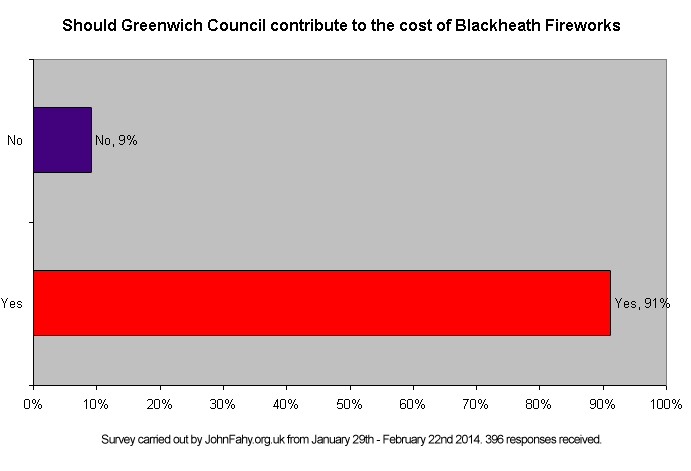 The results are now in for the survey I carried out regarding Greenwich Council helping to fund Blackheath Fireworks. The results show that 91% of the respondents think the council should support this community event. A big thank you to hundreds of you who engaged in the survey. When push comes to shove, community events get a very big thumps up. At a time of austerity, financial pressures limit the ability of local authorities to spend as much as it might on events like the Fireworks event on Blackheath. However, determining priorities are a day to day activity. I very much hope that public opinion will be taken into account when the Council decides its response. I will continue to campaign for Greenwich to make a financial contribution. In addition I will be donating £100 to help keep the event alive.